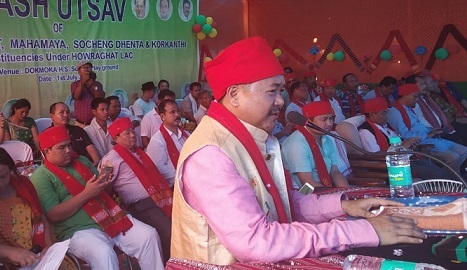 The Karbi Anglong Autonomous Council (KAAC) Chief Executive Member (CEM), Tuliram Ronghang, has promised that development will no longer be an alien concept in the administrative district. “I will take development to every corner of the administrative district – ensuring that benefits percolate down to the grassroots level – and this is the main objective of the Bharatiya Janata Party (BJP) Government,” the CEM stated. This observation was made by Ronghang at a function held on the occasion of BJP’s Vikas Utsav at Dokmoka HS School playgroundon Sunday in Howraghat Legislative Assembly, Karbi Anglong district. Gracing the event as the chief guest, Ronghang further stated, “My prime objective is to ensure that the wheels of development start moving in Karbi Anglong and development touches the lives of the marginalised section of people here. My top priority is to make Karbi Anglong a developed district.” He sought people’s cooperation so that the wheels of development could move smoothly. The Vikas Utsav was attended by Deputy Chairman, KAAC, Ritesh Enghi, MLA Joyram Engleng, Executive Members (EMs), KAAC, Rupsing Teron, Tarendra Brahma, Ratan Teron, Raju Tisso, Khonsing Rongpi, Kache Rongpipi and Madhurya Dhekial Phukan along with Members of Autonomous Council (MACs) Mongol Sing Timung, Darsing Ronghang, Horensing Bey, Ramsing Timung and Lunsing Teron, vice-president, BJP, East Karbi Anglong District Committee Bharat Kumar Timung, party secretaries and others. The CEM announced that an open stage would be constructed at Dokmoka playground and people’s grievances would be looked into in consultation with the local MACs. On the occasion, mosquito nets and saplings were distributed among the needy and ducklings were also distributed among women self-help groups (SHGs). Earlier, the CEM inaugurated Bhuban Chandra Terang Memorial Boys Hostel at Thedong village under Socheng Dhenta MAC Constituency under one-time special grant fund 2017-18. The hostel was constructed at an estimated cost of Rs 50 lakh. The CEM also inaugurated the road from Mon Timung to Teke Rongpi Village. However, he expressed his dissatisfaction over the road construction work and directed the concerned contractor to reconstruct the road with better work quality. Another road in Dupor Timung Village under Mahamaya MAC constituency was also inaugurated by him.